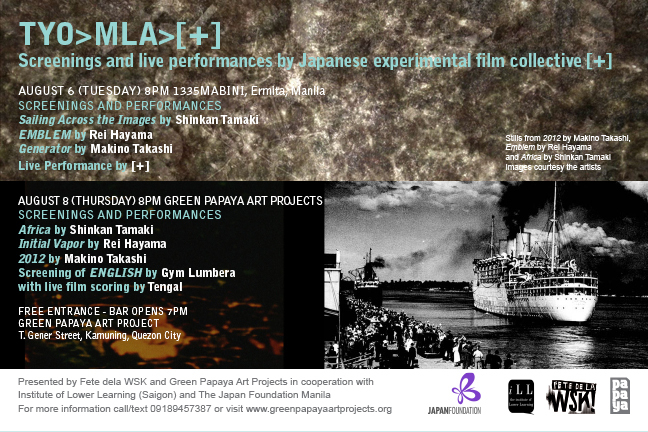 Screenings and live performances by Japanese experimental film collective [+] in Manila, philippine. [+] is an artist collective and curatorial project formed by three of Japan’s most exciting artists working with the moving image — Makino Takashi, Shinkan Tamaki and Rei Hayama — whose ongoing critique and research in experimental film aspires to open up new possibilities in film culture, yet at the same time questioning film’s very materiality. Working with films and audio-visual media of innovative quality that resist existing categories, they’ve screened, performed, published and exhibited throughout Japan and internationally. They’ve collaborated with the likes of Jim O’Rourke and participated in prestigious international platforms such as the International Film Festival Rotterdam. For the second leg of TYO>MNL>SGN, [+] will present six of their individual film works as well as two film performances: [Space Noise] by Makino Takashi and [ULTRA spectrum] by Shinkan Tamaki. This edition will also see them in dialogue with current Green Papaya Art Projects residents and fellow moving image explorers, the local film collective Tito & Tita. [+] in Manila is part 2 of the TYO>MNL>SGN platform of collabs and performances, with a focus in advancing awareness of new directions in sound and music, and film and the moving image. Taking place as 2 instalments in the months of July and August 2013, TYO>MNL>SGN takes 2 groups of Japanese artists to Manila and Saigon to engage in activities that encourage interaction with their counterpart artists and cultural communities in each of the respective cities. 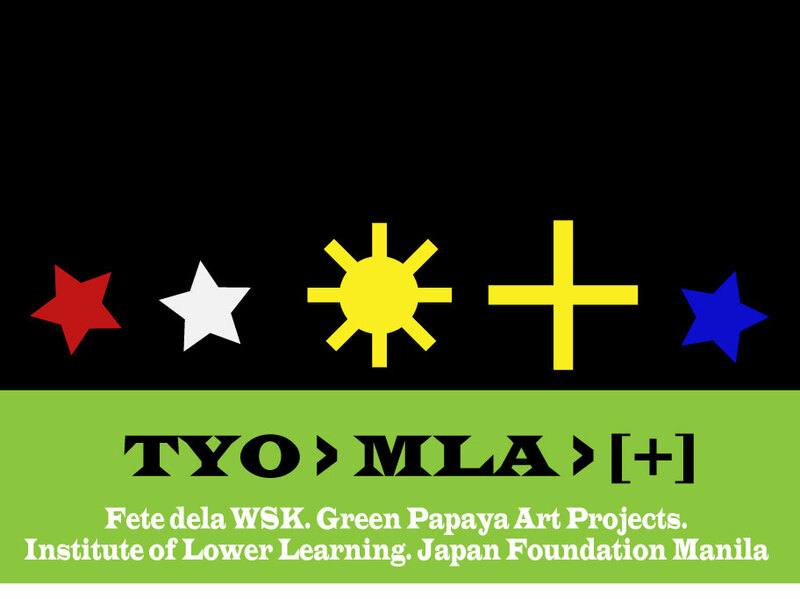 TYO>MNL>SGN is organised by Green Papaya Art Projects and managed by SABAW/Fete de la WSK in Manila, in partnership with iLL – the institute of Lower Learning in Saigon, and made possible with the support from the Japan Foundation Manila.